The year began in black and white. 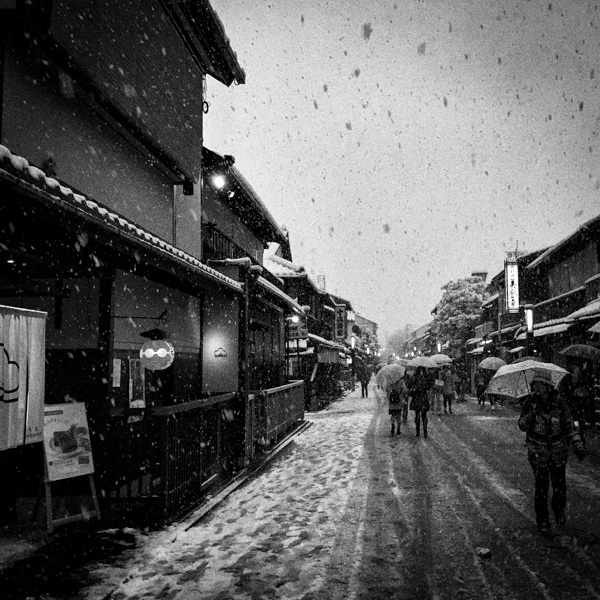 Tiny flurries from above and then flakes fatter and softer, all color of a January first Kyoto removed. Perfect, really. 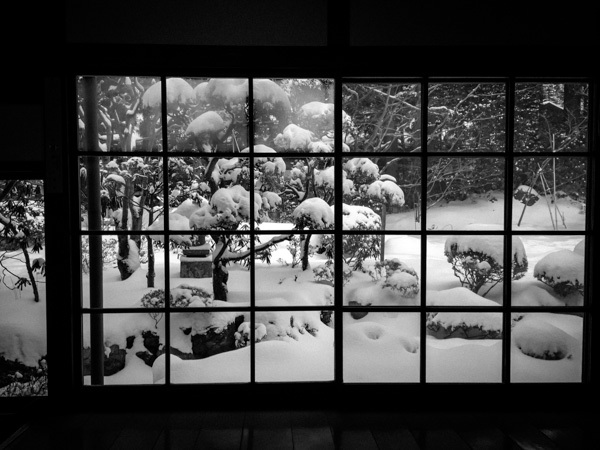 For, snow or not, Japanese cities go blank the first few days of the year — shops shutter, streets silent everywhere beyond the temples. Aside from walk or bike around, there really isn’t much to do. My travel companions and I dressed ourselves in waterproof gear and, iPhones in hand — iPhones always in hand — set out to traipse across the sloppy city. We ate taiyaki and warmed ourselves with coffee. 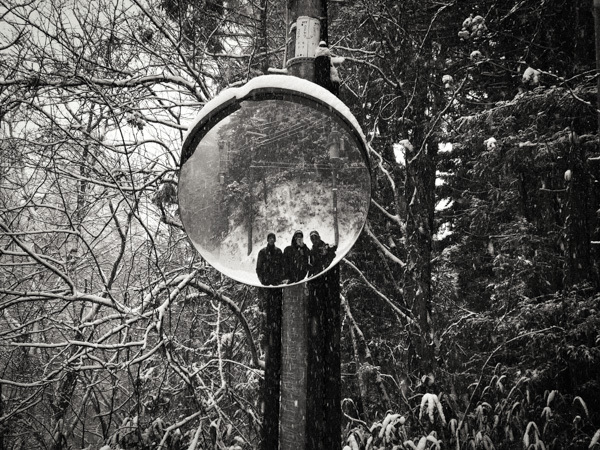 Together we Instagrammed in a manic three person feedback loop beneath what would be dubbed the single largest Kyoto snowfall in decades. Those who know — the scientists? the maniacs? the bored? the incarcerated? — say that the average snowflake is made up of 180 billion molecules of water. 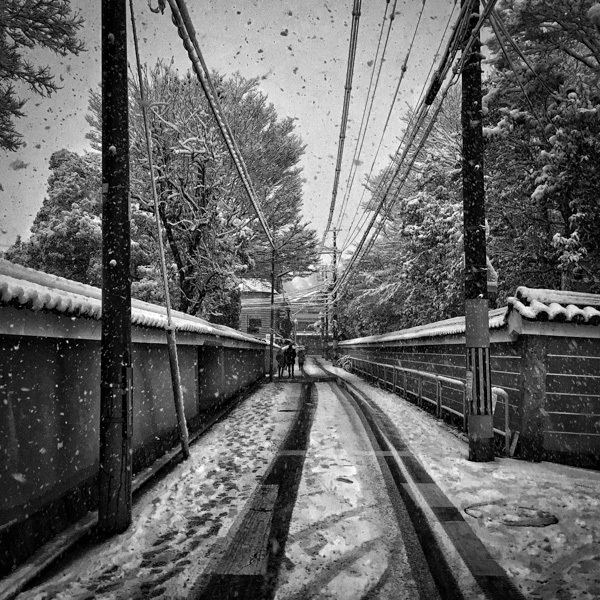 The snow reminded me of ash and I couldn’t help but think of the firebombing of Tokyo and what Tokyo would look like today had it been sparred, as Kyoto had been sparred, during World War II. “Between January and July 1945, the US firebombed and destroyed all but five [major] Japanese cities.” Kyoto suddenly felt tenuous. We photographed and captured as much as we could. It fell for hours, finished by nightfall. Slept a dreamless sleep. The next day we woke early to catch a sequence of trains to Koya-san, a so-called sacred mountain (are not all mountains sacred?). The sky had shifted from a snowy steel to the crisp and pure blue of Japanese winter. 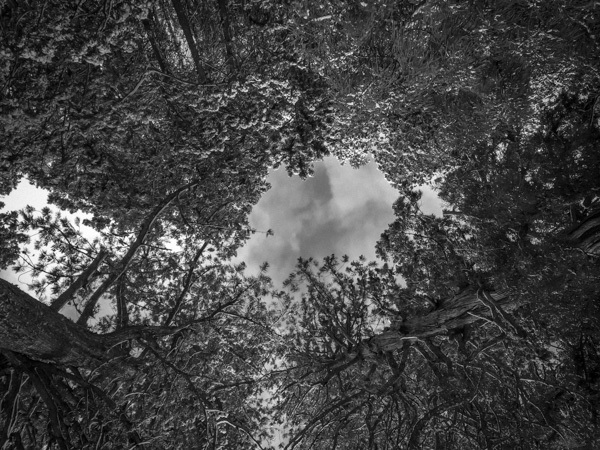 But as the train passed through tunnel after tunnel and micro climates changed, the skies greyed once again. 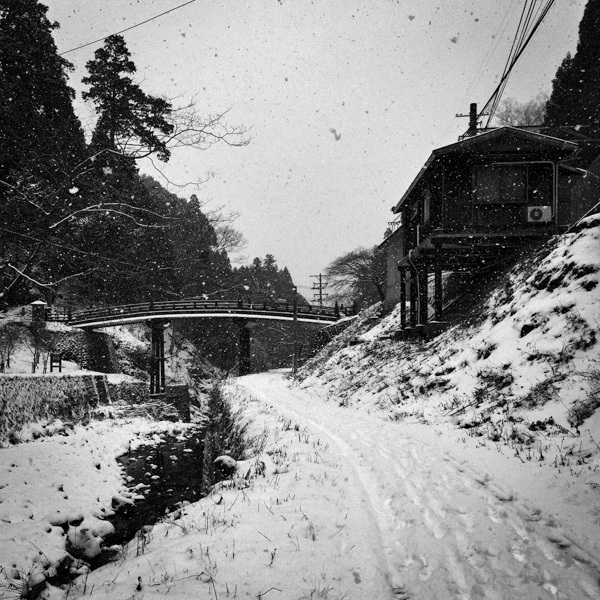 By the time we disembarked at Gokurakubashi Station the wind was leaden with snow and the landscape powdered a good six inches deep and the station manager gave me a worried look when I asked him to point to the start of our trail, the Nyonin-no-michi. Nyonin-no-michi is the “woman’s path” — literally. Nyonin (女人) means woman, michi (道) means path. (No is a Japanese particle indicating possession.) Women weren’t allowed to enter into the inner grounds of Koya-san until the fifth year of Meiji, 1873. Instead, this path was their pilgrimage, currently only with one, small, woman specific temple (Nyonin-do), but historically containing many more. Our original plan was to complete the full twenty two kilometer pilgrimage hike up the mountain — the Cho-ishi-michi (町石道) or “Stone marked path.” The way pilgrims visited before trains and cable cars. This was my third visit to Koya-san and I had never done the full walk. But the snows made it treacherous, and so we revised our explorers’ itinerary and settled on the more demure woman’s walk. A still respectable ten kilometers. Even those ten kilometers would prove impossible (or at least not very fun had we tried to complete it), and so we walked only the first four of Nyonin, as far as the Daimon (“Large Gate”), the main entrance to Koya’s Shingon Buddhist interior. Despite the shortened distance the walk was difficult, uphill mostly, and through increasingly deep snow. It felt like we had used ten or twenty kilometers of energy for the four (maybe five) of which we walked. But what a gift it was — a gift from the mountain or Kobo Daishi (the spiritual leader and founder of the Shingon Buddhist sect planted on Koya-san precisely, this year, 1,200 years ago), a gift from nature or time and timing. However rationally or irrationally you like to frame the coincidences of life, it was beautiful. The snow was heavy enough to make things dicey but the hike never veered into truly dangerous territories. 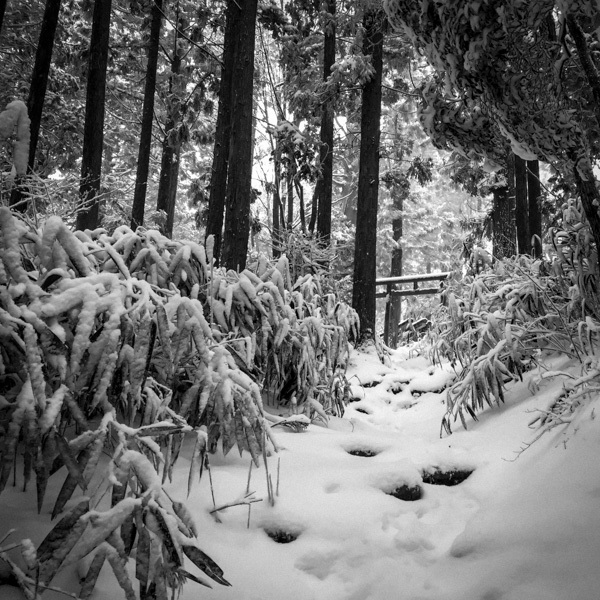 And the white blanket upon our tiny world: each tree branch dusted, the path, the stone steps, the torii gates — sometimes hidden until you were practically beneath them — all in that soft January light united to produce one of the most quiet and stunning hikes I had ever been on. Every creature in the forest held its breath, us included. It was like walking through a winter Hokusai print. The experience was unreal and I believe we all knew how special it was as we experienced it. We walked in awestruck silence. Photographed. Whispered, Wow, into the air, every now and then. A shorter walk, yes, but a good walk. You have a plan. Outside influences force revisions. At first you feel let down — the original plan somehow the Platonic plan. But quickly you realize those outside forces have produced something special, maybe even more special than the original (unknowable). A parable for every new year. We emerged from the Nyonin in front of the great Daimon. And great it was. Towering red, with fifteen foot tall Kongorikishi standing guard by its sides, mouths frozen in un and a. The site free of people except two tourists with a selfie stick — somewhere, online, are many snowy selfies in front of the great gate. Unique to walking or hiking in Japan are the bookends to the days. 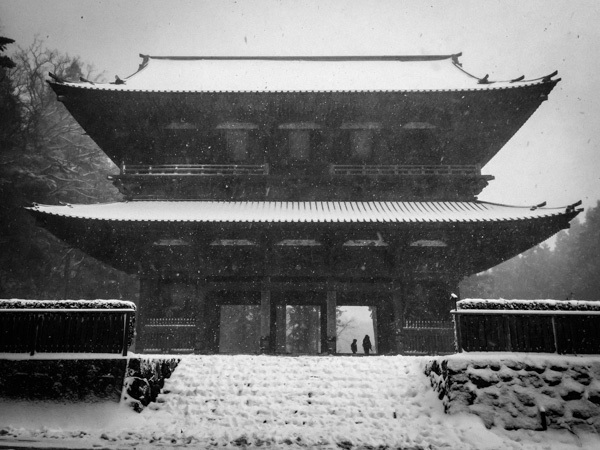 We arrived at our temple late in the afternoon, snows still heavy, blown sideways by an ever harsher wind. Were led to our generous tatami room, powerful gas heater already baking in the corner, and shown the location of the giant bath. Within minutes we were in the bath — waters on the edge of scalding, waters for monks, not for tourists, the true medicinal properties, so they say, of a bath occurring only at these higher temperatures, not luke-warm or overly comfortable temperatures — and could feel our muscles turn to goo, the aches of the hike melt away. You take that warmth and wrap it up within yourself, you carry it around for the rest of the night. Then dinner and sake. The temples of Koya-san known for their food, their shojin-ryouri or Buddhist vegetarian fare. Nearly a dozen plates or bowls of various vegetables (but no root vegetables, no garlic). Yet intricate and delicious in spite of this seemingly neutered palate from which they work. Everything capped with heapings of fresh, steaming white rice (you gently place your no carb diet next to your wet boots, just before the temple entrance). You sleep a silent and deep sleep, the room cold, the futons warm. And then wake to prayers. This temple of ours carrying out the goma taki, or fire purification ritual, each morning. Gathered in a small, nearly pitch black room lit only by candles, a large fire is stoked in the corner, the prayers and wishes and worries of the pilgrims having been written on long, thin pieces of wood. They are burned. The room itself is wooden. There is little ventilation. It is at once a delicate and violent ceremony — and seems incredibly dangerous. The low ceiling is black with soot. They do this every morning. You are grateful to see it but worry for the health of the monks. They seem old, though, the oldest looking like a kindly prune. And so you use their non-death to console yourself. Of course, you know, this is survivor bias. Regardless, you have been purified, so they say, and the place did not burn down. Your reward is breakfast. You eat the breakfast — simple and not nearly as opulent as dinner, but still flavorful and filling. It is accompanied by more complementary sake — two tiny jugs. More than seems necessary. A bracing for the cold to come? Dress and head outside into the brightness. The clouds now gone. A blue sky high above. Put on your boots and walk again. It’s a new year and this is how it begins — smelling of soot, sunshine splashed against your face, eyes squinting into the snow covered mountain landscape. There's still so much to see. From the book cafe in Daikanyama, Tokyo.